Last week I talked about doing the most important things first. I’ve appreciated the comments made after my last blog entry. Several ladies told of ideas that have helped them. I have always had a hard time determining what the most important things are. The thing that has helped me the most, I saw in one of the many books on organization that I read in hopes of becoming more organized. 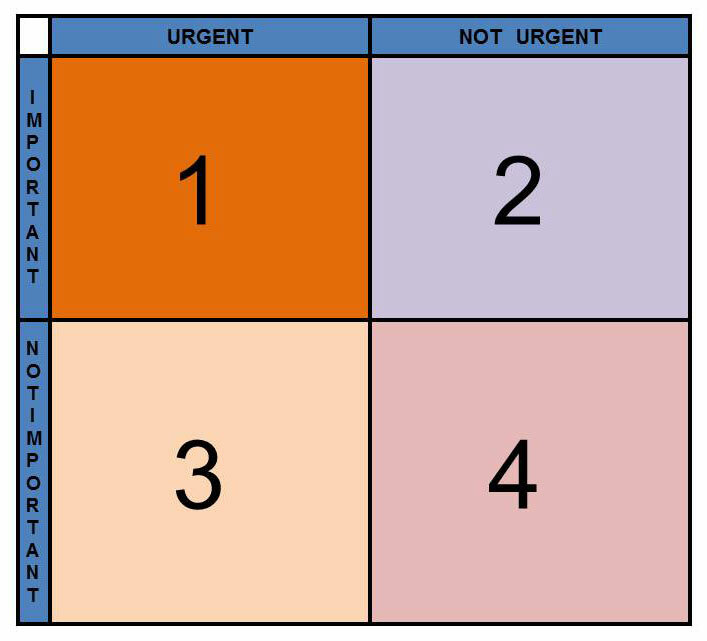 The graphic above is called the “Eisenhower matrix” because President Eisenhower used it, and it really makes sense to me, maybe because I’m such a visual person. I found a cool video that explains it, probably better than I can. Check it out; it’s only 2:24 minutes long and a great place to start. So, let’s talk about the matrix for those who are stay-at-home moms. How does it work for you? I’m going to tell you what things I think fit where, but please recognize that these are just MY priorities. Yours may be entirely different, and that’s ok.
Wow! I’m so excited! I’m going to go try them! Don’t want to use an app? Make a to-do list. Keeping the Eisenhower matrix in mind, rank the importance of each item with 1-4 (or use A, B, C, and D). Then start with the 1s and go after it! Let me know how that works for you. Love this! And the video is super helpful. I’m going to go look for helpful aps, too. Thanks for the advice. I’ve seen a similar set up with flexible/not flexible, and negotiable/non-negotiable. (from Tell Your Time ebook). Its helped me sort out various tasks when I start feeling overwhelmed. Then I know that anything in the flexible-negotiable box can be ignored.